At the workshop on diatoms from Lake Mývatn I followed my normal procedure of taking lots of photographs so that I can pick out the best ones and write the meeting report around them. However, this time the card failed while I was copying the images to my hard disk, and I only managed to recover 3 photos. I don’t try to economise by buying unknown brands, this was a genuine SanDisk Extreme PLUS SD card that I have been using since 2016. SanDisk are going to replace it under guarantee. This card was already a replacement under guarantee, after my previous SanDisk Extreme failed after only a year. Now I understand why some cameras aimed at professionals have 2 card slots, so you have a backup. My first microscope was a Watson Kima, bought second-hand when I was still at grammar school. I have kept it for over 50 years, but now I need the space so I reluctantly decided to give it away. I have used it occasionally over the years and it has always worked fine, but this time the fine focus didn’t work properly – it either did nothing or else moved much too far. I asked for help in the Amateur Microscopy group on Facebook and in the Microscope group on Yahoo! and Merv Hobden and SaraLee Shepherd both replied promptly with the same diagnosis and treatment, and they were correct. The fine focus knobs move a block up and down in a dovetail slider, and the grease had hardened. With the body tube removed, it should be possible to lift the block a little and it should slide down again. I could lift it, but it didn’t slide down. Following advice, I undid two screws holding the plate on top of the block, being careful not to lose the spring below it. Then I slide the block up and out of the dovetails. I used Ronsonol lighter fluid to clean off the old grease and then applied a thin smear of Vaseline. Everything went back together easily, and the fine focus know works again. I offered the working microscope in the Amateur Microscopy group and the Microscope Wants, Sales And Services group on Facebook, free to anyone who could collect it, and it now has a new home. 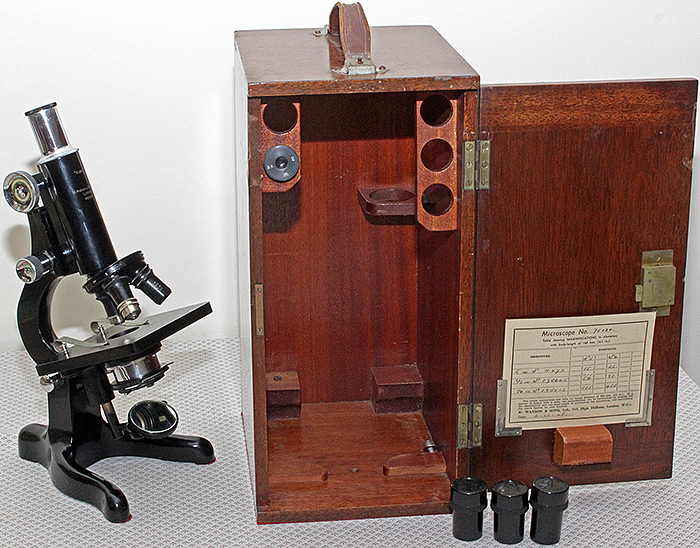 Before parting with it, I added the serial number to the Watson Microscope Stand Dating Table on the Quekett website.